Get rewarded for interacting with all of your favorite entertainment! Earn Perk Points when you check into shows and movies live on TV or streaming on any streaming services. 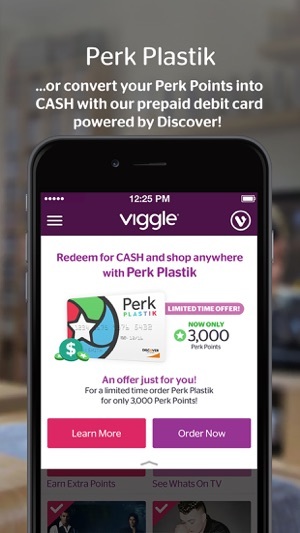 Viggle is powered by Perk, the #1 Mobile Reward Program! Perk has more rewards, more apps and more giveaways than anyone! Redeem Gift Cards for top brands like Amazon, PayPal, Walmart and over 200+ more! Check in to any TV program by tapping on the Viggle app. Once checked in, you'll start earning Perk Points. Redeem your Perk Points for Gift Cards, Prizes, or exchange your Points for cash with our powerful prepaid debit card, Perk Plastik. 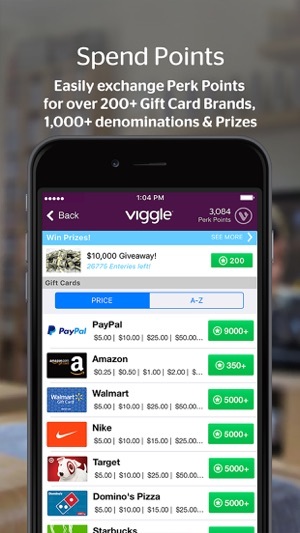 Viggle while you Perk and get rewarded! This App has Drastically Changed Over the Years!!! I luvd this app SOOOOO MUCH when I found it in ‘12 or ‘13! It was SOOOOO GREAT!!!! I got so many wonderful gifts!!!! I had cable back then. It wanted to listen to what I was watching. It is very different this time, in that I’m streaming instead of having cable. But the only way my Viggle App wanted to behave, was by replaying the same commercials over and over and over.....etc, on my phone!!!! I cant even stop to watch my show, I have to keep tending to them. I had to tend to the these commercials so much, which, btw, are worth only 2 points! That doesn’t sound so ridiculous, until u learn that 5,000 points = ONLY $5!!!! That is SOOOOOO NOT WORTH IT. So, I’m having to delete this app! Sad! 😢🤧 So, just FYI, 2 points is worth about $0.002 in this app!!! You have to watch five sets of commercials to earn a penny!!!! Yeah, I don’t think so. I sent an email to the support team requesting help with the Viggle app, I was checking into several tv programs an was supposed to be earning 2 plus 2X perk points but was only getting 2 perk points. He answer I received was first to make sure I had the lasted version of Viggle which I did. I wrote back stating I did everything I could possibly do, re-download the app, turn off my phone and reboot but still only received 2 perk points. I wrote again, i was told that they would send the issue to the tech team but nothing has been fixed. Now I’m not receiving any perk points at all. It just keeps running the stupid ads. Nothing is being done! A waste of my time to use this app since they switched to perk points. Very dissatisfied.